Viva Voce on tour in China - New Zealand Choral Federation Inc.
Auckland choir Viva Voce has recently returned from a trip to Beijing, where it was invited to sing at the China International Chorus Festival, while at the same time promoting New Zealand’s World Symposium on Choral Music in July 2020. The choir sang four concerts, the first in the nearby port city of Tianjin, the next two in the prestigious Beijing Concert Hall and the fourth as featured guest choir in the festival’s competition finale at the impressive new Tianqiao Arts Centre. Conductor John Rosser reports that audiences were warm and responsive, and the choir has come home exhilarated by the experience. “Despite long delays in traffic, getting utterly drenched as we queued for the Forbidden City, and a flash flood in Tianjin that prevented our getting out of the bus for over two hours and meant that our lunch had to be ferried to us by restaurant staff wading through thigh-deep water… we had a great time! 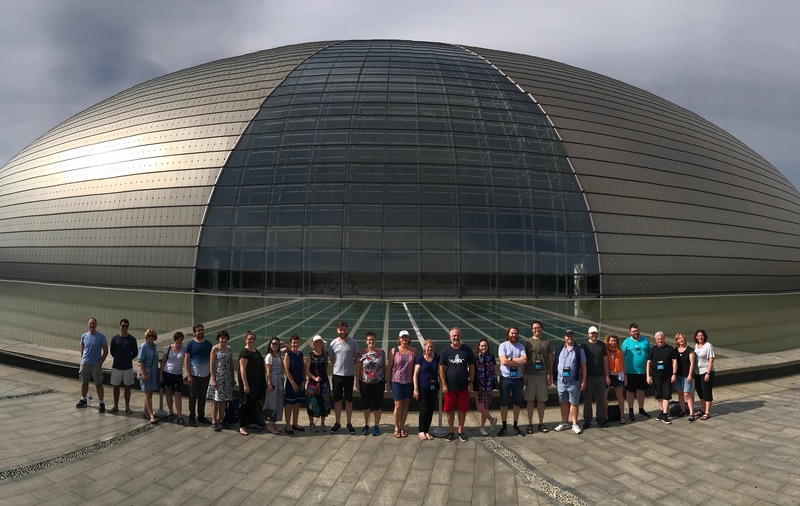 We walked in Tiananmen Square, on the Great Wall and – a special highlight for many of us – through the National Centre for the Performing Arts (‘the Giant Egg’), where we sang on the fabulous concert hall stage.